Honestly, although I cannot throw them out, most of the bonus half-square triangle units I create end up in a completely unorganized bin with many others for a “some day” project. So, it is a little surprising that I have already used used this month’s crop in two small quilt projects. 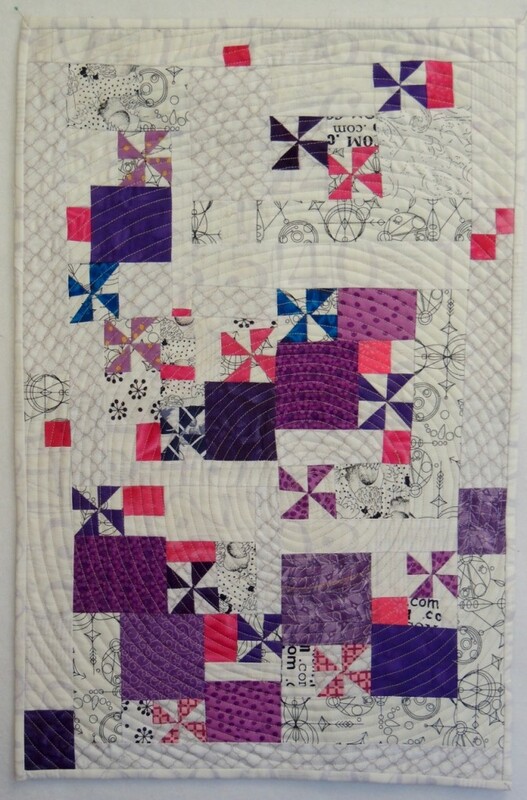 The pinwheels were treated as “squares” for the Floating Squares exercise from Sherri Lynn Wood’s book, Improv for Modern Quilters to make this little quilt. This little quilt measures 15 inches wide by 22 1/2 inches tall. Because in this process everything is cut with scissors and no measuring, I didn’t measure or square up the bonus blocks used to make the pinwheels in any way and some of them were chopped as part of the process of creating the floating squares. This little quilt was so much fun and came together very quickly … and I even quilted it (with a simply spiral) the same day. I confess that I keep thinking about using this technique for a sampler quilt setting … and if I can find the set of lotto blocks I misplaced, it could happen soon. I shared the first, small Clover Blossom block I made from the batik bonus blocks (from the violets for my Old MacDonald’s Mystery Sampler) earlier this month. I blogged about the slippery scrappy slope that I found myself upon with this project last week on my blog … and today, I bit the bullet and made 92 MORE scrappy HST units to finish the borders for this quilt. 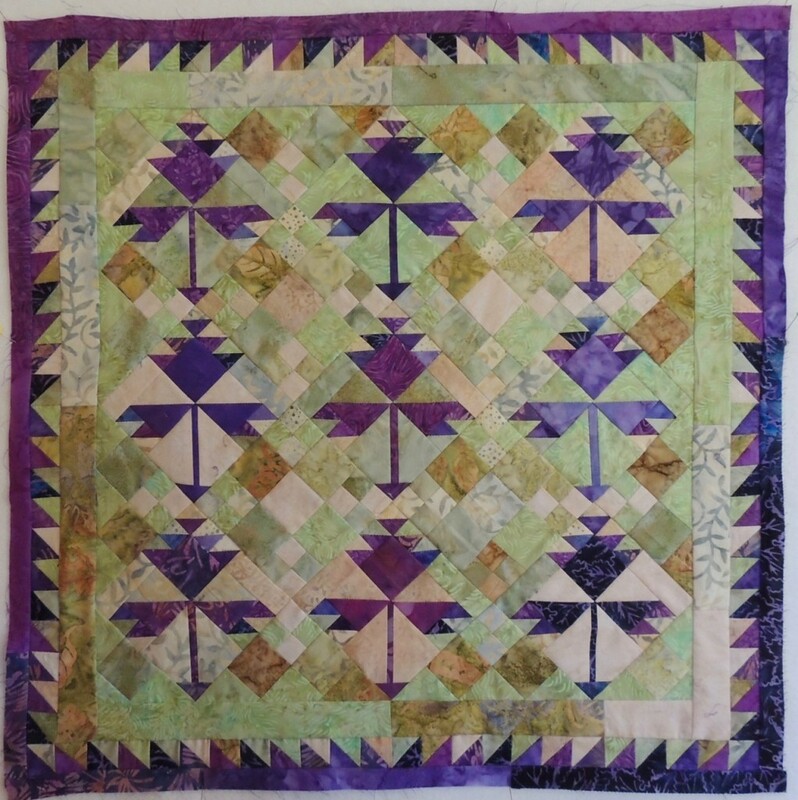 For this quilt, the bonus triangles were carefully pressed and squared up to a uniform size (1 1/4 inches, to finish at 3/4 inch). When it came to making more for the border, I couldn’t force myself to make them that small, so I used a die cutter to cut triangles for 1 inch (finished size) HSTs. This measures 24 inches square. Quilting this is on the list of possible “quilting day” projects tomorrow. Since the local guild doesn’t recognize National Quilting Day, I’ll be spending the day in my sewing space at home … working on something to be determined tomorrow morning. With the dissolution of the NQA, I’m not sure if it’s National Quilting Day, International Quilting Day, or Worldwide Quilting Day … whatever you call it, if you are celebrating, have fun !